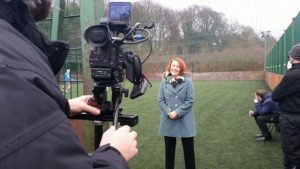 Walking football, a slow-paced version of the beautiful game which is specifically targeted at the over 50’s, will feature on ITV’s tonight show this week. 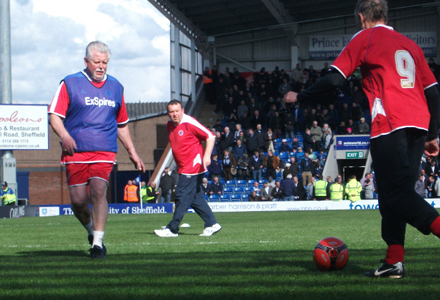 The founders of the game, Chesterfield FC Community Trust and their Ex-Spires walking football team will be shown this Thursday in The Truth About Exercise: Tonight. ITV presenter Fiona Foster attended an Ex-Spires session at the Akademy in Dronfield and spoke to some of the players. Among them was 78-year-old Eric Bagshaw, who took up walking football six years ago after being diagnosed with diabetes. Eric talked on camera about the marked improvement in his health since he has been playing walking football. ”I could feel myself getting stronger each week, and I just kept working at it, just loved it.” He said. Taking up the story of when he faced a medical examination, Eric adds: ”The doctor came down and he said, ‘Now then Eric, what have you been doing for the last six months’? 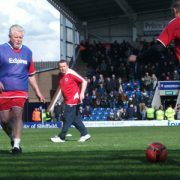 Chesterfield Community Trust’s chief John Croot developed the idea of walking football after the Trust received funding from the Football Foundation for a project called ‘Extra Time’. He explained: ”It was around 2010/2011 when I went to a presentation before we put the bid in and one of the things said was to look for unusual activities which would be ideal for older people. ”The requirement was for something which would have low injury risk, cardio vascular benefits and help develop friendship groups. ”Coming back I was going through what had been talked about and I thought, ‘Why don’t we play football, but walk it’? The Truth About Exercise: Tonight is on this Thursday, February 9, from 7.30pm to 8pm on ITV.